The average American eats 279 eggs per year, according to the Washington Post. This may or may not come as a surprise to you depending on your own egg-eating habits, but the numbers tell an interesting story: Americans are eating the greatest quantity of eggs in about five decades. The timing appears to coincide with changes in how eggs are perceived from a health standpoint. For more than 40 years, the federal government’s Dietary Guidelines for Americans placed restrictions on dietary cholesterol, which many people saw as a caution against eating certain foods, eggs included. The government dropped that restriction in 2016, largely in response to shifting views among nutritionists, many of whom now believe that consuming cholesterol in food may not affect cholesterol levels in healthy adults. Simply put, experts say eggs are healthy again. For Austin culinary students, the timing couldn’t be better. Austin hosted its first ever ATX Brunch Festival in March, and as all good brunch enthusiasts know, eggs are a staple for this mashup of meals. Not to mention, eggs have found favor with many low-carb dieting trends such as Paleo, Whole 30 and keto – as well as vegetarian and gluten-free eaters – which makes them particularly popular at the moment. With eggs back in the good graces of the U.S. Department of Health and Human Services and dieters alike, it’s worth taking a minute to appreciate what they bring to your menu. This isn’t the first time we’ve written about eggs, and for good reason. For starters, they’re exceptionally nutrient rich. An egg only has about 75 calories, but packs 7 grams of high-quality proteins and a hearty helping of vitamins and minerals, according to WebMD. Looking for a new twist on poached eggs? 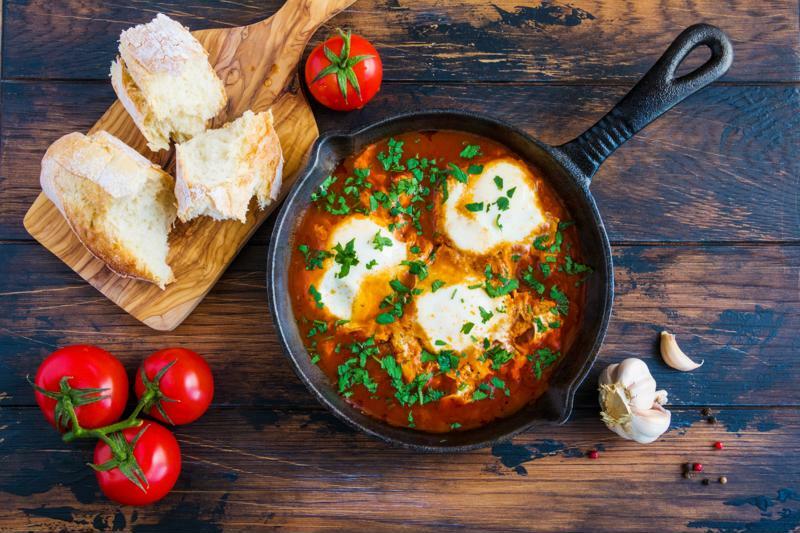 Try North African shakshouka. What’s more, there are so many different ways to cook eggs. For example, there are at least two different types of scrambled eggs. A hard scramble is cooked all the way through, usually with a dryer texture, while a soft scramble is a little underdone, providing a wet or creamy texture. Then there are deviled eggs (which have so much appetizer potential), poached eggs (they take a minute to get the hang of, but are so worth it once you do) and eggs over easy (go wonderfully with home fries). This is to say nothing of quiche, omelets, egg salads and frittatas – eggs are hardly confined to breakfast and brunch. They have a place at every meal, as we pointed out in an earlier blog post. Once you’ve mastered the classics, it’s worth exploring some of the more colorful and interesting ways you can cook with eggs. For example, did you know that a really thin omelet can be used in place of a wrap? Given the popularity of low-carb diets and the need for gluten-free alternatives, it may be worth experimenting with this idea. Another interesting creation is a fried tofu banh mi omelet, like this recipe from Food Republic. It takes a classic Vietnamese street food and turns it into a delicious, exciting breakfast sandwich. In Italy, pizza capricciosa is typically served with eggs on top. In many stir fries and fried-rice dishes, eggs are scrambled in with the other ingredients. Not to mention, eggs are a prominent ingredient in many desserts, from flan to creme brulee and more. Eggs have always been an exceptionally diverse and nutritious ingredient. The fact that they’re healthy and back on the menu for many Americans is all the more reason to get cracking on new egg recipes that will delight your customers. Whether you’ve been recently inspired by Austin’s first-ever brunch festival, or you’re already studying culinary arts there, there’s never been a better time to start discovering the full potential of eggs.